NEW ORLEANS – It was quite the weekend in collegiate outdoor track & field. Name the only man faster in collegiate outdoor history than Grant Holloway in the 110 hurdles. That would be the collegiate record holder Renaldo Nehemiah. Holloway ripped down the track and over the hurdles at the Tom Jones Memorial this past weekend to the tune of 13.16. Not only was that a PR of 0.23 seconds but it also doubles as the second fastest mark in collegiate outdoor history. That was the fastest time recorded by a collegian in the event since 2014 when Devon Allen clocked the same time. Nehemiah’s record is 13.00. The sophomore from Chesapeake, Virginia, wasn’t done there as he returned to the track in the 4×100 and 4×400. Holloway helped the Gators win both of those events as they nabbed the nation’s No. 4 mark in the former with him on the third leg and won the latter with him running with the baton second. 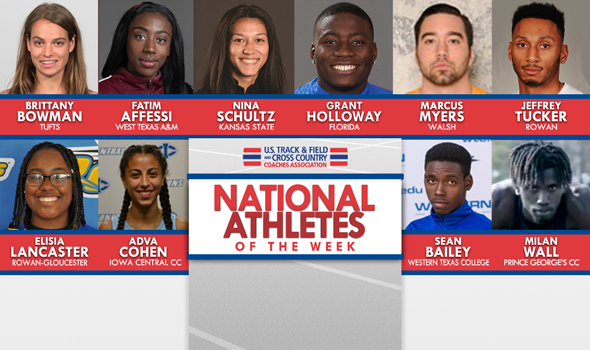 Holloway is the first Florida athlete to be named National Athlete of the Week during the outdoor season. Nina Schultz stood out on the international level this past week. Schultz, competing for her native Canada at the Commonwealth Games, earned a silver medal in the heptathlon with a PR of 6133 points. It was in the high jump where Schultz stole the show. Schultz cleared 1.84m (6-0½) to score 1029 points and took sole possession of second place, which she would never relinquish. The sophomore from New Westminster, Canada, would be tied for third on the collegiate chart with that mark. Schultz is the first Kansas State athlete to be named National Athlete of the Week during the outdoor season. A Big 12 athlete hasn’t won this award since Texas Tech’s Hannah Carson did so in 2016. Marcus Myers posted the nation’s lone NCAA Division II Automatic Qualifying Mark in the hammer throw this past weekend at the Walsh Cavaliers Invitational. Competing at his home meet, the senior from Grelton, Ohio, hit a throw of 66.23m (217-3) in the hammer, taking over the top spot on the NCAA Division II Descending Order List. His mark sits just outside the NCAA Division II outdoor collegiate all-time list, and ranks 22nd on the All-College Descending Order List this season. This is the first National Athlete of the Week honor for the Walsh program during the outdoor season. Fatim Affessi posted a historic triple jump mark at the NMJC Ross Black Open over the weekend, hitting a barely wind-aided 13.23m (43-5). Affessi’s mark was not only the lone NCAA Division II Automatic Qualifying Mark in the triple jump this season, but it also comes in as the fifth-best wind-assisted mark in NCAA Division II outdoor collegiate history. The mark by the sophomore from Switzerland was the best during the regular season in NCAA Division II – wind-assisted or not – since 2014. This is the first National Athlete of the Week honor for West Texas A&M’s program during the outdoor season. There is a select group of men in NCAA DIII history who cleared seven feet in the high jump outdoors. Jeffrey Tucker is now one of them. Tucker won the event title at the Coach Pollard Invitational this past weekend when he topped 2.17m (7-1½). That easily bettered Tucker’s previous outdoor PR of 2.11m (6-11), which was set nearly two years ago to the day at the Hopkins Loyola Invitational. The all-time top-10 is within his sights now. That chart starts at 2.18m (7-1¾) and goes all the way up to 2.24m (7-4¼) for the division record set by Kym Orr in 1985. Tucker is the first male athlete from Rowan to be named National Athlete of the Week during the outdoor season. One national lead wasn’t enough for Brittany Bowman, so she made it two. Bowman already had the No. 1 mark nationally in the 10000 at 34:51.07, set two weeks ago at the Tufts Snowflake Classic. She returned to the track this past weekend at the Silfen Invitational and clocked the nation’s fastest time over 5000 meters. Bowman crossed the finish line in 16:42.30, which is .29 seconds faster than what Ithaca’s Taryn Cordani did the same day at the Bison Outdoor Classic. Both of those times are outdoor PRs for Bowman. She bettered her PR in the outdoor 5000 by 29 seconds. Bowman is the first female athlete from Tufts to be named National Athlete of the Week during the outdoor season. Looking for the fastest 400 runner in the nation from this past weekend? Look no further. Sean Bailey’s time of 45.53 at the NMJC Ross Black Open not only put him atop the NJCAA Division I Descending Order List this week, but it was faster than any other collegiate athlete in the country from this past weekend. The sophomore from Jamaica now sits fourth on the All-College Descending Order List in the event. This is the first time a male athlete from Western Texas College has been named National Athlete of the Week this season. Adva Cohen continues to impress, as the first-year athlete from Israel ran the nation’s fastest steeplechase time from this past weekend at 10:04.00 at the Wichita State KT Woodman Classic. Making her outdoor collegiate debut in the event, Cohen’s time is the first sub-11 minute time in the event in NJCAA Division I this season. She also now ranks sixth on the All-College Descending Order List in the event. Cohen is the first female athlete from Iowa Central CC to win National Athlete of the Week honors since Leanne Pompeani in 2016. Milan Wall competed against NCAA Division I talent at the Towson Invitational this past weekend, and still managed to come in third in the 400 with a time of 48.88. The freshman from Toney, Alabama, now owns the top time in the event in NJCAA Division III this season. This is the second time that Wall has been named National Athlete of the Week this season. Elisia Lancaster recorded two NJCAA Division III leading marks this past weekend at the Osprey Open and Multi Meet. The freshman hit the top shot put mark in NJCAA Division III on the season at 13.21m (43-4¼) in addition to posting a 39.99m (131-2) in the discus. This is the second time that Lancaster has been named National Athlete of the Week this season.